The next few days I will be posting an email I sent home to friends while I was away for the 15th annual HSMG Soap Conference in Portland Oregon. I will be adding websites and pictures to the email for you. This is my second day here, but the first day of the conference. 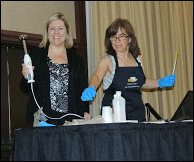 Keynote speaker, Mary Lou Quinlan, was great, vendors were fun, but the best part of the day were the 2 workshops I did with Marla. We work very well together, I can anticipate what she needs before she know herself (what do you expect, I was trained by doctors) Both sessions were on formulating creams and lotions (don’t look at me with glazed eyes!) and there were over 200 people who attended. Of course they came to see me in my pretty new black apron (with the slogan “Raise the Bar, Use Handcrafted Soap”) Believe it or not (because I actually don’t believe it myself), I wasn’t nervous. I had fun with it. Amazing, huh? Two of the vendors (Anne-Marie Faiola of Brambleberry and Debbie May of Wholesale Supplies Plus put on a party after hours called Casino Night. They brought in real dealers and transformed the place into Las Vegas. Roulette, Black Jack, whatever you wanted to play. We all started off with $1000 (fake money, of course). At the end of the night I had $3425 (I kid you not!) We turned our money in for raffle tickets which I won absolutely nothing with. It was still a great day.